Bangkok, Singapore and Tokyo have been ranked as the top three most popular destinations in the Asia-Pacific region for international tourists, according to the results of the inaugural MasterCard Asia Pacific Destinations Index. The MasterCard Asia Pacific Destinations Index polls 167 destinations, including island resorts as well as towns and cities across the region, by total number of international overnight arrivals, cross-border spending, and the total number of nights spent at each destination. These 167 destinations represent 90.1 percent of all international overnight arrivals within the region. According to the index, Thailand's capital Bangkok topped the survey, with international overnight visitors breaking the 20 million mark for the first time last year. Thailand also dominated the top 10 destinations, taking three of the top 10 rankings, with Phuket securing fifth place and the coastal city of Pattaya coming in at eighth place. Following Bangkok is Singapore and Tokyo, which both welcomed 11.8 million international overnight visitors last year. Other top 10 cities include Seoul, Hong Kong, Kuala Lumpur, Bali and Osaka. Chinese tourists have become the tower of strength in the growth of international tourists for the Asia Pacific region, which contributed to about one-third of the total growth in number of tourists from 2009 to 2015, at least five times higher than that from the second country, South Korea, according to Matthew Driver, Group Executive, Global Products & Solutions, Asia Pacific of MasterCard. Of the top 20 destinations by total expenditure per day, Shanghai welcomed the biggest spenders with USD269 spent daily, followed by Beijing, Seoul, Singapore and Hong Kong. However, in terms of total expenditure by international tourists, Bangkok again seized number one at USD15.2 billion on the top 20 destinations. Tourists growth has been strong in the Asia Pacific region, with half of the top 10 destinations saw 10 percent growth or more in international overnight visitor numbers between 2014 and 2015, according to the index. American business magazine Forbes has listed Metro Manila, Philippines as among the 10 Best Budget Travel Destinations for 2016. “The Philippines has long been overlooked as a south-east Asia travel destination, but it’s now starting to attract the attention it deserves,” Talty wrote. Talty pointed out that although Metro Manila had the impression of being congested, polluted and noisy, there were a lot of things to see both in and out of the city—Intramuros being one of them. 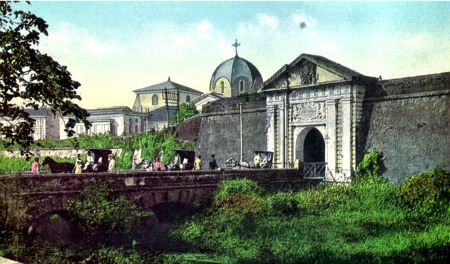 “The old colonial walled city of Intramuros can be explored on foot or by horse and carriage, known as Calesa,” she wrote. She also noted how it only took a short boat ride from Malate, Manila to see The Rock, a former World War II fortress and now a haunted ruin, combined with adventure sports like ATV’s, hiking, kayaking and camping. The province of Laguna, just a couple of hours from Manila, was also credited for its seven lakes, underground caves, hot water and mud springs and loads of water sports. Despite the downside, she said that the Philippines offered a “more unique experience” which “makes up for it. Rounding out the list of budget-friendly destinations are George Town, Malaysia; Xi'an, China; Barcelona, Spain; Thrace Region, Turkey; Morocco; Hungary; Malaysia; Croatia and Puerto Rico.